The vibrant colors, fresh tastes and mouth-watering smells of the farmers market are captivating, but the experience as a whole can be a bit overwhelming. It's easy to find yourself back in your kitchen wondering how to bring the ingredients you purchased together into a meal. 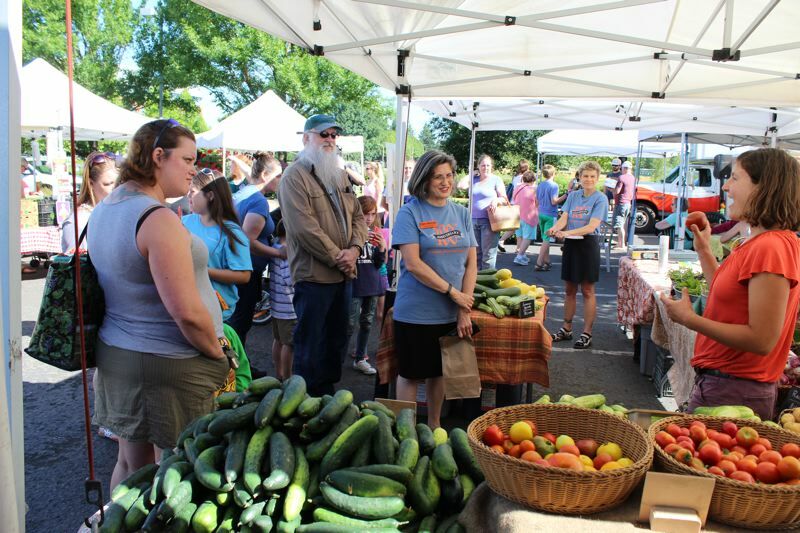 The Oregon State University Extension Service, Clackamas County and the Oregon City Farmers Market have solved that dilemma by teaming up to offer market tours and food demonstrations on the second Saturday of the month through October. Shoppers meet local farmers, learn about their farms and farming practices, and sample fresh produce during the "Know Your Farmer, Know Your Food" tour led by Kelly Streit, food and nutrition instructor with the OSU Extension Service program in Clackamas County. "Some of these fruits and vegetables were pulled from local farms last night or this morning so you're getting the freshest, you're getting locally grown, which is creating less of an environmental impact," Streit said. "And the cost of in-season produce is often comparable, if not less expensive, than the grocery store." This month Oregon City will join in celebrating National Farmers Market Week in coordination with the national Farmers Market Coalition. A variety of activities are planned, including a social media awareness campaign and a farmers market photo contest, along with other activities to engage consumers, vendors and market enthusiasts. Next weekend at the OC Farmers Market, the Oregon Farmers Markets Association and Oregon Health Authority will be sampling fresh peaches, and kids can make buttons for their favorite farmer. Cost can be a big factor in food-purchasing decisions, especially for low-income families, but the OSU Extension Service's SNAP-To-It! program is making the market accessible to everyone. SNAP offers food benefits to eligible, low-income individuals and families. Every Saturday SNAP participants can purchase $6 in tokens and receive a match of $6 more. The second Saturday of the month through October, SNAP members receive an additional $5 in SNAP tokens by participating in the market tour. That adds up to an extra $11 to spend at the market. That's exciting to farmers like Anna Wilson from Brown Bottle Farm in Mulino. "People who probably would not normally come to the farmers market are getting involved in these programs and learning about good food, which builds community," Wilson said. Oregon City resident Nancy Grayber has participated in the SNAP-To-It! program at the Oregon City Market for the past two years. "The program helps me get more fresh fruits and vegetables in my diet," Grayber said. "And the chef demo gives me versatile recipe ideas that I can customize for my dietary restrictions." Following the market tour, shoppers can watch a chef demonstrate the preparation of a seasonal recipe using ingredients sourced at the market, taste the final product, and take the recipe home to try on their own. Times: 9:15 a.m. - SNAP registration – info booth (SNAP cardholders). 9:30 a.m. - "Know Your Farmer Know Your Food" tour (open to the public and available in Spanish). 10 a.m. - Chef recipe demo – Market Kitchen (open to the public).